It was 2 years ago, to the day, that I moved to Springfield, Il. A lot has happened since. I survived the worst winter that Springfield has seen in 30 years, which was incredibly painful for someone who had lived in Texas his whole life. I also got to enjoy a couple of incredibly mild summers. Again being from Texas I’m used to 100 degree heat from May through September, not a mere week of 100 degree temps in August. While I have seen and gone through a lot of changes there has been one constant. My favorite local beer. My first experience with Rolling Meadows was at a Springfield bar, I think it was The Barrel Head, can’t say for sure, but lets just go with that premise. I was just starting my journey into the world of Craft beers. I saw that there were three brews from a local brewery,Rolling Meadows, on tap: Springfield Wheat, Lincoln Lager and Abe’s Ale. I’m a fan of supporting local so my only choice was which of these three to order. I decided to go with the Abe’s Ale. I have to admit the high end 8.5% ABV is what made my final decision. I was not disappointed. In fact I became hooked. I continued to order the Abe’s Ale when at bars that had it. 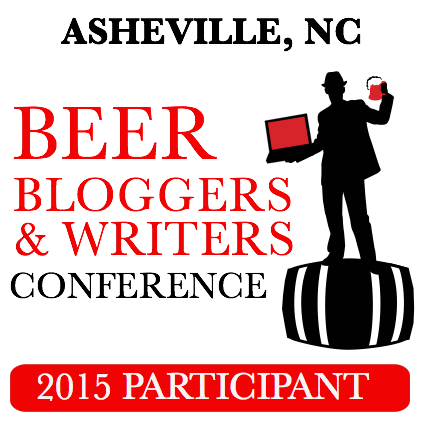 Every time I tasted the beer, I seemed to pick up on a new characteristic, a new note. One time it was the vanilla aroma, another time I was able to recognize the dry finish, which kept me wanting more. My appreciation of Abe’s Ale only grew with my knowledge of craft beer and as my palate became more refined. Some beers that I used to enjoy no longer get me excited, as I have now tried over 500 unique beers. 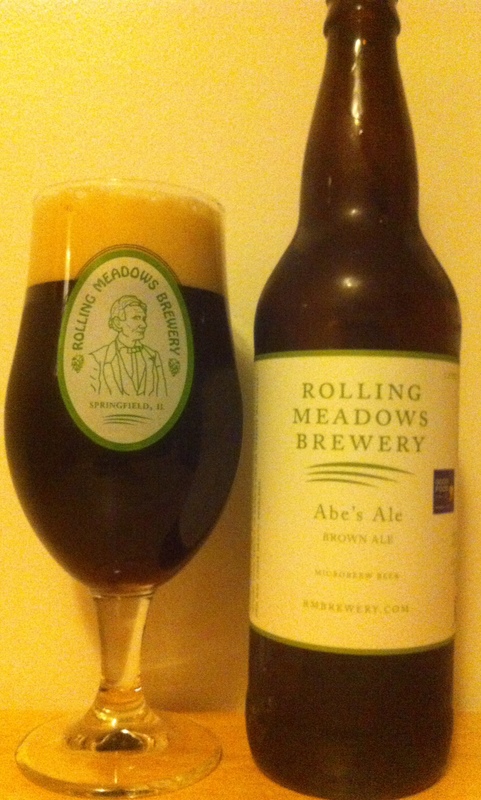 The Rolling Meadows Abe’s Ale has consistently provided me, at each tasting, with pleasure and enjoyment. One night I happened to be at the Craft Beer Bar in downtown Springfield and saw that they had the Barrel Aged Abe’s Ale on tap, sitting at over 13% ABV. My eyes grew wide in disbelief, I was not even aware of such a beer. I had to order it and was incredibly impressed. I have only had that beer once, due to it’s limited availability. I look forward to this year’s batch being ready for consumption. The Abe’s Ale pours dark brown, closer to black, with a nice white foam head. The maltiness of the beer is what has made it a consistent pleaser in my life. What’s crazy is that until going on a Rolling Meadows Brewery Tour and doing this review, I had no idea it was made with maple syrup and molasses. You may be thinking, “It says right on the label ‘maple syrup brown ale.’” The thing is, I always had Abe’s Ale at bars. I had never bought a bottle of the brew until now. Shows how much I continue to learn about it, just like I continue learning more and more about craft beer each and every day. If you have never tried the Abe’s Ale, do so next time you get the chance. There is a reason it’s Rolling Meadows flagship beer. I am not alone in the opinion that it is a great beer. It was a “Good Foods Award Winner” in 2013. Change is a constant, they always say. Weather will be good, then bad. Gas prices will be high and then low and then high again. My preference for different styles of beer will ebb and flow. One thing I know I can always count on is the Rolling Meadows Abe’s Ale providing my palate with joy. 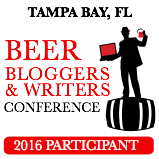 This entry was posted in American Brown Ale, Beer Style, Rolling Meadows Brewery and tagged Abe's Ale, ale, beer, brown ale, double brown ale, imperial brown ale, review, Rolling Meadows, Rolling Meadows Abe's Ale, Rolling Meadows Brewery, Rolling Meadows Week. Bookmark the permalink.